Chapter Chat . . . . .What's that? It's a new recreational book group for 5th & 6th graders. Listen for the monthly title on morning announcements or find it posted outside of Ms. Ford's door. Simply read the book, then bring your lunch & join us in the library on the last Monday of the month for a book talk with your friends. All for fun and the love of reading! 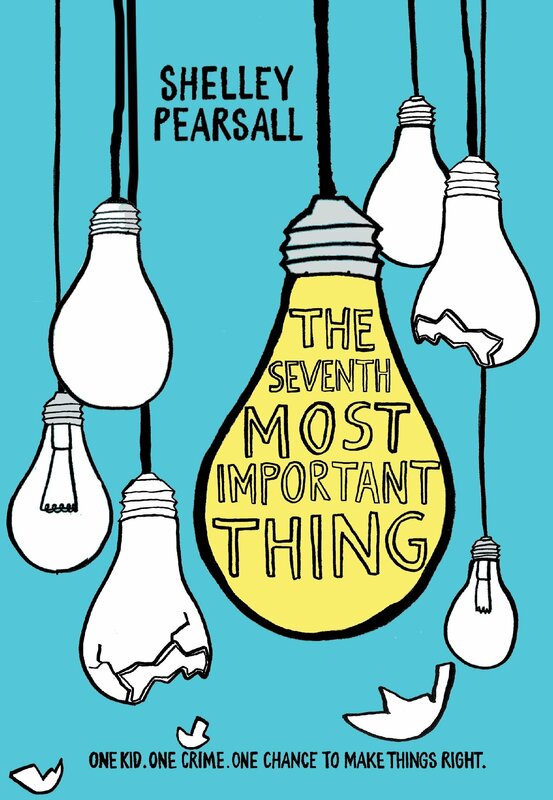 The November book of the month is The Seventh Most Important Thing by Shelley Pearsall. To stay up to date with all of our Library news, check out our Library webpage. Thanks to a grant by The Oakwood Schools Foundation, Harman will be adding Kindle E-readers and a collection of digital/audio books to our library in the near future. In addition, the Harman PTO has a made it possible for us to purchase more Playaways. These new tools will give our students additional options in enjoying quality literature. Thank you again Oakwood Schools Foundation & Harman PTO! Many of the students in speech this year are using an exciting tool to help them describe and expand their language. We wanted to share our excitement with you! The expanding expression tool (EET) is a kit developed by a speech-language pathologist from Michigan named Sara Smith. It is a multi-functional, tactile tool to help with language and writing development. It can be used for oral expression and written expression. 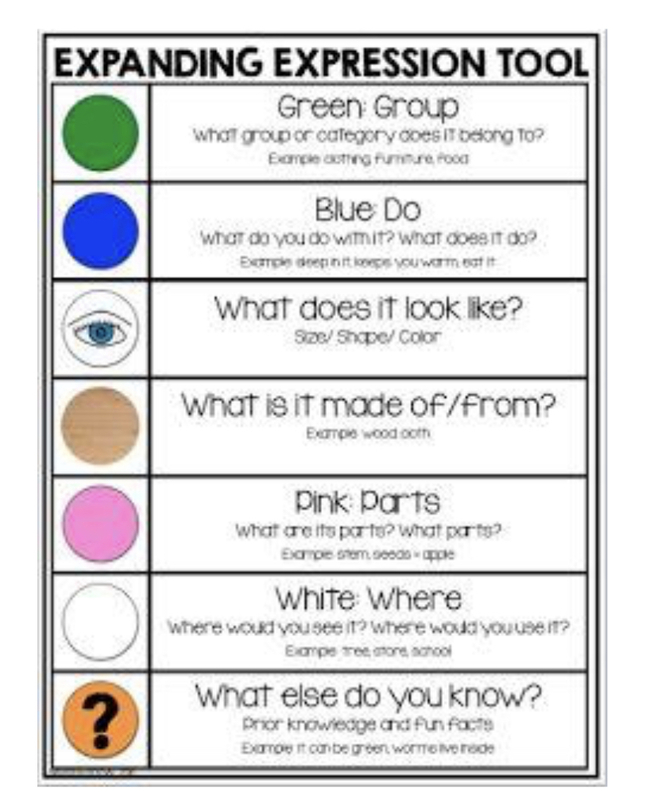 The tool uses a color-coded chart to help a student describe an object by the group it belongs in, what it does, what it looks like, what it is made of, what its parts are, where you find it, and what else you know about it. This can be a verbal or written activity. This tool is great for tactile learners, who can benefit from using a string of beads to represent each different dot on the chart. It also offers a great visual layout for children who benefit from graphic organizers and structured activities. The EET is particularly helpful for struggling/reluctant writers, but it can be differentiated for different ages, abilities, and needs. I've used the tool one on one, in small groups, and in whole-class instruction, which may include students with or without disabilities. This year I am introducing it to parents and having them use the beads at home. At the very basic level, the EET tool helps learners describe an object. Often, students can label an object but can't tell about it. This affects their ability to categorize, make connections and associations, comprehend, compare/contrast, etc. The EET can be used for descriptive writing, personal narratives, informative writing, and opinion writing. Once students can describe an object in seven sentences, you can easily move on to stretching it to seven paragraphs. Ask your children, maybe they have seen or used this tool! 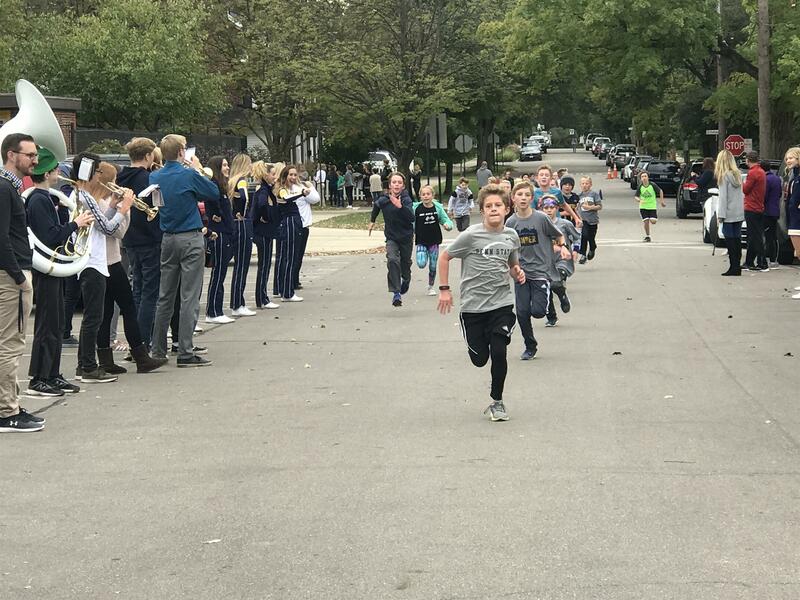 October was Bullying Prevention month and our 5th-grade students have been learning about how to develop healthy relationships, identify unhealthy relationships, and prevent bullying. Please help us prevent bullying at our school by reviewing the bullying criteria and the four main types of bullying behavior listed below. Please have a conversation with your child about bullying and bullying prevention. For information about the Empowerment Tools, students can use when standing up to mean or bullying behavior, please visit the Harman School Counselor Page. 2. An Imbalance of Power: Kids who bully use their power—such as physical strength, access to embarrassing information, or popularity—to control or harm others. Power imbalances can change over time and in different situations, even if they involve the same people. 3. Repetition: Bullying behaviors happen more than once or have the potential to happen more than once. Pretending to be someone else online in order to acquire or post personal or false information about someone else. Posting mean or hateful names, comments, or content about any race, religion, ethnicity or other personal characteristics online. Creating a mean or hurtful webpage about someone. Ludwig, T. (2015-2017). www.trudyludwig.com Ludwig Creative Inc. The fourth graders travelled to Caesar Creek State Park in September. This field trip provides us with the opportunity to get an in-depth look at ecosystems and participate in a fossil dig. During the pond talk, students meet with Park Rangers to explore producers, consumers, and decomposers in an ecosystem. 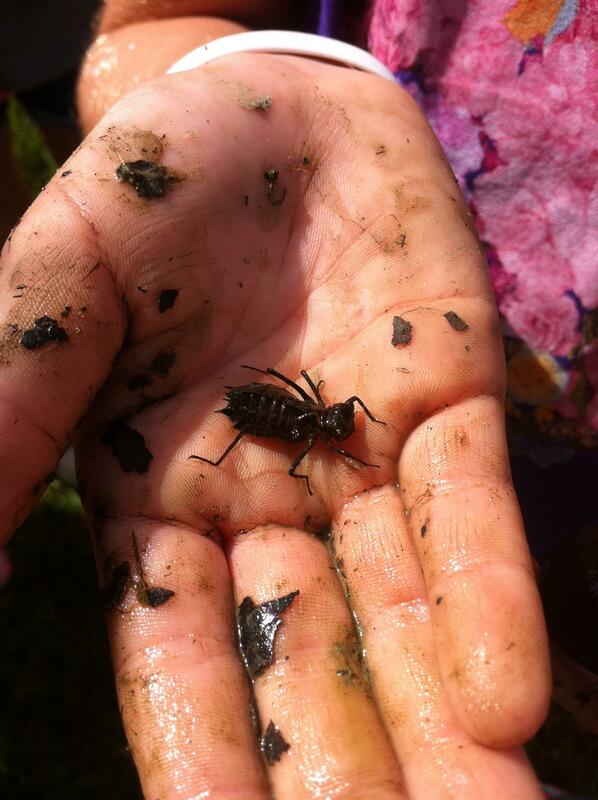 They examine plant and animal life scooped up from the shallow waters of the pond. Fourth graders study the past to learn how our planet has changed. During our fossil dig, we find fossils of life forms that are 500 million years old. These fossils date back to when Ohio was covered by a warm, shallow ocean. Examining these fossils helps us learn what they looked like, how they ate, and how they moved. In October, the fourth graders journeyed to Sunwatch Village. 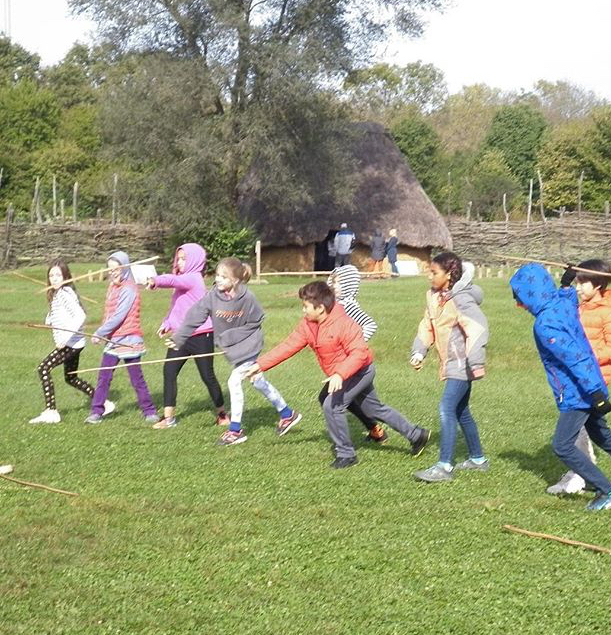 This prehistoric village allows our fourth graders to learn about early Ohioans and their ways of life. We experience their customs, the ways they kept track of time the ways they kept track of the seasons, and the housing they constructed and lived in. We spend time in their garden learning their methods of planting. Additionally, we spend time in the field learning, the way their children did, how to hunt. These two field trips are authentic and hands on experiences for our students. They put our students in the best possible position to reinforce content learned in the classroom. We look forward to these experiences each year. We have spent time in some of the classrooms teaching and reviewing hand washing and other healthy habits with our students. We know that hand washing is the #1 way to stay healthy, but another very important way to stay healthy is by getting enough sleep. When we sleep our body is repairing itself from the days activities. When we don't get enough sleep it can affect every aspect of our life. Remember it is important to "disconnect" ourselves from all electronic devices (computer, phone, TV, video games, iPods, etc.) at least an hour before we go to bed to allow our brains to slow down. If someone has trouble sleeping, reading, meditation, and other relaxation techniques can prepare your body for sleep. Thank you to Emma Butler, Katherine Cezeaux, and Alicia Dunlap for coordinating our Book Fair and Patricia Noel Mittelstaedt for her leadership with the bake sale. We appreciate everyone's support and contributions to this event which generously provides new books for our library and classrooms. Many thanks to all of our families who helped coordinate and send in treats and activities for our Halloween parties. The students always enjoy these special days!